California rangelands are being converted to other uses. 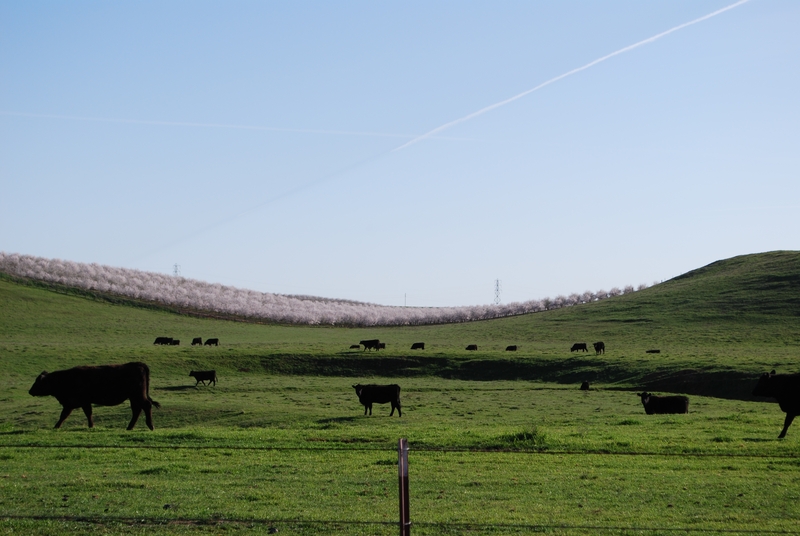 With California rangelands returning as little as $1 per acre per year, ranchers and grazing are being replaced not only by ranchettes and shopping malls but by tree crops, vineyards and other types of agriculture. This conversion is particularly evident in the San Joaquin Valley. The Fogarty family has been in the cattle ranching business in Stanislaus County since the 1870s. In recent years, they’ve seen rangeland around them converted to housing and orchards. “With the conversion around us, we are affected with a declining water table, increased traffic and rural crime associated with high production agriculture,” said Bill Fogarty. Ranchers, researchers, managers, agency representatives and conservationists will gather in January to discuss challenges and opportunities in maintaining rangelands. Keeping rangelands and ranches viable for wildlife, wetlands and water will be discussed at the 9th annual California Rangeland Conservation Coalition Summit set for Jan. 21-22 at the Gene Bianchi Community Center in Oakdale, 16 miles northeast of Modesto. The summit is sponsored by the California Rangeland Conservation Coalition and the University of California Cooperative Extension. At risk is the future of California’s ranching industry and the ecosystem services that ranches provide: diverse wildlife, unique wetlands and healthy watersheds. At the rangeland summit, ranchers, researchers, land managers, agency representatives and conservationists will focus on rangeland science, land management, land-use policy and livestock production. The event will feature presentations on the challenges ranchers face, impacts of rangeland conversion to natural resources and opportunities to support working ranches and rancher stewardship. Ranchers from Colorado and Montana will share new opportunities they are finding to keep ranching viable through conservation efforts. The first day of the two-day summit will feature presentations and a ranch tour on the second day. This event is sponsored by University of California Agriculture and Natural Resources, Environmental Defense, Audubon California, California Association of Resource Conservation Districts, California Cattlemen’s Association, California Native Plant Society, California Rangeland Trust, Santa Clara County Open Space Authority, Center for Natural Lands Management, Defenders of Wildlife, Cal-Pac Chapter Society for Range Management, East Bay Regional Park District, Grazing Lands Conservation Initiative - California, Natural Resources Conservation Service, US Fish and Wildlife – Partners Program, Mid-Peninsula Open Space District, Point Blue Conservation, Sierra Business Council, Sierra Nevada Conservancy, Sustainable Conservation, InterWest Insurance Services, Inc., The Nature Conservancy, Koopmann Rangeland Consulting, and Westervelt Ecological Services. In addition, Oakdale Cowboy Museum and numerous private ranchers are sponsors, hosts and speakers. The event is open to ranchers, researchers, land managers, agency representatives, conservationists and others interested in California’s rangelands. Journalists are encouraged to attend the event. For more information, visit http://www.carangeland.org/calendarevents/2014summit.html or call Pelayo Alvarez at (916) 313-5800, ext. 107. 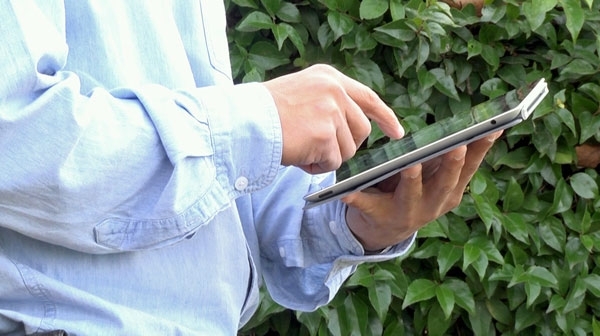 CropManage can be accessed from an iPad in the field. UC Cooperative Extension is rolling out a new website for farmers that will help them save money and protect the environment. CropManage contains a wealth of UC research in a format that makes it easy for growers to apply to their farms. Conceived by Michael Cahn, UCCE farm advisor in Monterey County, and programmed by the UC Agriculture and Natural Resources web team, the free website – ucanr.edu/cropmanage – allows farmers to quickly calculate the precise fertilizer and water needs of their crops. By applying only the exact amount of water and fertilizer to optimize plant growth, the new website keeps farmers from using too much. Overfertilizing in the past has resulted in groundwater contamination with nitrate, a serious concern in the Salinas Valley and other farming regions. In coastal areas, overpumping wells can lead to sea water intrusion into the aquifer. On Feb. 26, Cahn will offer a mini CropManage workshop during the 2013 Irrigation and Nutrient Management Meeting at the Monterey County Agricultural Center, 1432 Abbott Street in Salinas. The meeting runs from 7:45 a.m. and concludes with a pizza lunch at 12 noon. Following lunch, the one-hour CropManage workshop begins. No reservations are required. Cahn and his colleagues, Tim Hartz, UCCE specialist in the Department of Plant Sciences at UC Davis, and Richard Smith, UCCE advisor in Monterey County, have been conducting trials for years to determine whether the combination of quick nitrogen testing and weather-based irrigation scheduling could reliably reduce the amount of nitrogen that lettuce growers apply. “We demonstrated a 30-percent reduction in nitrogen fertilizer application,” Cahn said. The excitement of such a significant result was tempered by the fact that implementing the research results on individual farms would require some serious math. “When we introduced farmers to the quick nitrate test, some said they would have to hire someone to manage all the data, keep records and make decisions. I realized that we could make this a lot easier for them by programming software to do the work,” he said. For example, farmers who wish to use weather data to schedule irrigation for lettuce must sign into CIMIS (California Irrigation Management Information Service) to request an email with reference evapo-traspiration for their locations. The data must be punched into an equation along with the irrigation coefficient for lettuce – a figure that represents how much water the lettuce needs – and the size of the lettuce canopy at the time of irrigation. This time-consuming data collection and manipulation is eliminated with CropManage. “We’ve figured out how to facilitate all these calculations,” Cahn said. A screen shot from CropManage. CropManage automatically downloads the CIMIS data. The website pulls soil, crop growth and water needs information from a UC research database. The farmer goes to a simple website, names his or her fields, adds the type of irrigation systems to be used and how much water they deliver per hour. “In effect, they set up a virtual ranch,” Cahn said. 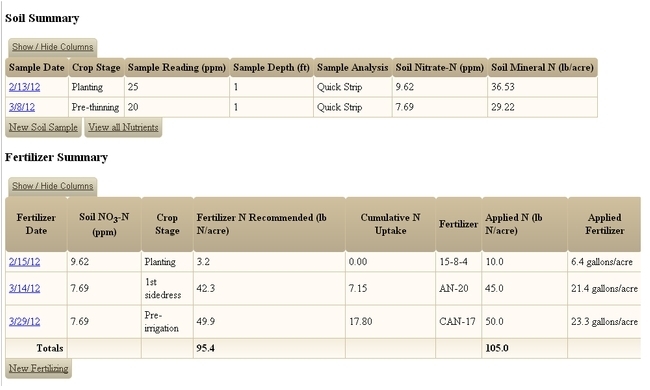 When the farmer is ready to plant, the type of crop and results of a nitrogen quick test are added. Throughout the growing season, farmers can monitor the progress of their farms by viewing online tables where irrigation, fertilization and growth are tracked. At any time, all the data can be downloaded as an Excel file the farmer can using for accounting or making reports. Corey Ranch manager Montes said he accesses CropManage on a tablet computer. Currently, CropManage contains information for production of romaine lettuce, iceberg lettuce and broccoli. Strawberries and caneberry data will be added to the system. Research is underway on leafy greens, such as spinach and baby leaf lettuce, so they also can be added. Development of the website was supported by a grant from the California Department of Agriculture Fertilizer Research and Education Program. For more information about the 2013 Irrigation and Nutrient Management Meeting on Feb. 26 or about CropManage, contact Cahn at (831) 759-7377, mdcahn@ucanr.edu. 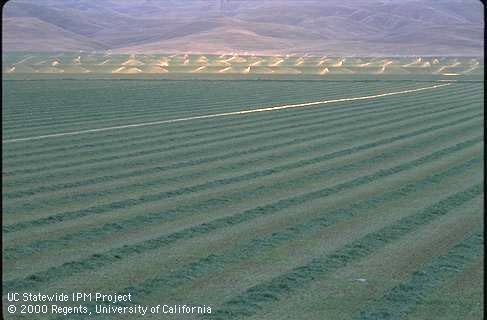 Researchers from UC Davis and Fresno State University have teamed up on a study to estimate alfalfa’s impact on regional nitrogen budgets and nitrate leaching losses in the Central Valley. Researchers and educators from the University of California and California State University have received funding for joint projects on priority issues such as urban residential water demand, restoring pollinator communities, and estimating alfalfa’s impact on nitrogen and nitrate leaching in the Central Valley. Leadership of California’s higher education systems made the funding available to jointly address issues in agriculture, natural resources and human sciences. Project criteria include collaborative research, teaching, or course development; development of student internship opportunities; and workshops, conferences, and symposia. Eight projects totaling more than $79,500 were selected from 30 proposals submitted. Reports on project outcomes are expected in December 2012. Richard Smith, UC Cooperative Extension advisor in Monterey County, and colleagues have developed a quick test to measure soil nitrate in the field. 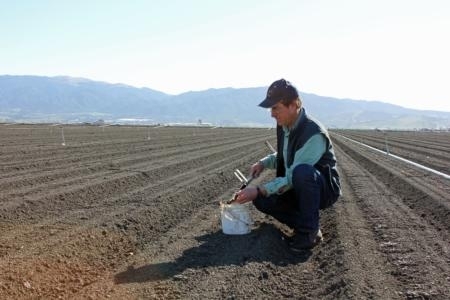 University of California Agriculture and Natural Resources is working to ensure that all Californians have access to safe drinking water and that the state’s farmers can grow enough food to help meet the world’s increasing demand. Research has shown that nitrogen fertilizer used in agricultural production can over many years move from a plant’s root zone into groundwater. In his research on how dairy operators can reduce water applications to their crops, Larry Schwankl, UC Cooperative Extension specialist at Kearney Agricultural Research and Extension Center in Parlier, has found that allowing less water to percolate will reduce impacts on groundwater. With shorter furrows, water applied per acre was cut nearly in half. In addition, manure water is often added to fresh water as part of dairy irrigation and fertigation practices, so being able to reduce the applied water also significantly reduces the amount of nitrogen applied. For more information, see Schwankl's Irrigation Management website. Residents voiced concerns about being left out of Delta management planning. 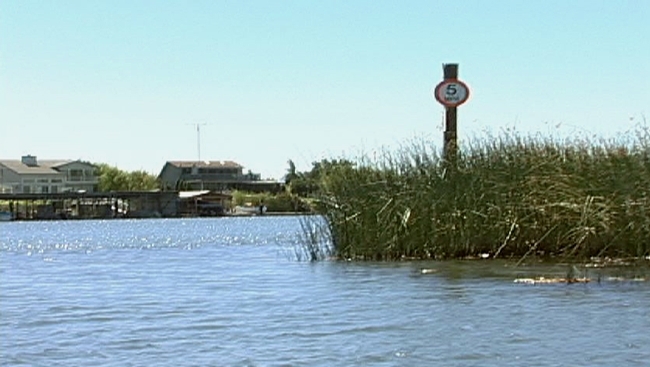 When water management plans are developed for California's Sacramento-San Joaquin Delta, local residents feel left out of the process, participants at community water conversations told University of California Cooperative Extension researchers. The discussions were held in the five counties adjacent to the Delta -- Contra Costa, Sacramento, San Joaquin, Solano and Yolo. The Community Water Conversations Project aimed to provide community members with an opportunity to discuss and learn about water policy options in the state in a facilitated, non-threatening and positive environment. The project was launched to provide Delta residents with an opportunity to discuss water issues in-depth and share their knowledge with one another, said Shelley Murdock, UC Cooperative Extension community development advisor and director for Contra Costa County, who organized the project with Carole Paterson, who was UC Cooperative Extension community development advisor for Solano County until her recent retirement. Many participants expressed dissatisfaction with the current water allocation process and proposals to resolve water issues. “The farther away you get from local knowledge the worse the decisions are,” one participant said. “The residents showed a high-level of knowledge about the Delta and its ecosystem, but expressed skepticism that policymakers would listen to their views,” said Jodi Cassell, UC Cooperative Extension natural resources advisor. Participants said they would like to see more public education about water, including its use, reuse and conservation. The UC Cooperative Extension team analyzed detailed notes to assess common themes among the suggestions made during the conversations. The researchers plan to share the views with policymakers and other stakeholders to increase their awareness and understanding. To summarize their findings, they produced a short report and a 13-minute video containing some of the comments made at the meetings. They can be viewed at http://ucanr.org/sites/CAH2OConversations. At this website, visitors can comment on the project, report and video. The 10 water conversations were held in libraries in Martinez, Suisun City, Moraga, Oakley, Elk Grove, Stockton, Walnut Grove and West Sacramento between May and August of 2010 and were attended by 128 area residents. University of California Cooperative Extension cohosted the meetings with non?partisan organizations California Center for the Book, the Water Education Foundation, the California State Library, and California National Issues Forums network.